A wacky inventor, his camera-crazy best friend and a madcap monkey make a massive mistake when let loose in a mad scientist’s laboratory. With lotions and potions spilling everywhere, the troublesome trio accidentally creates Franc, the product of a reaction between a common flea and one of the scientist’s mystery concoctions. What they fail to realize, however, is that this ‘monster’ is actually a soft-centered soul with an astounding talent for music. 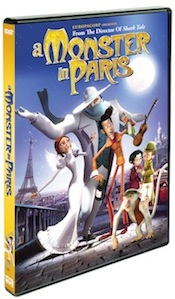 With the help of an enchanting nightclub singer Lucille, Franc becomes the talk of the town, just as stories of Paris’s newest monster attract the attention of the egotistical police commissioner, hell bent on securing a big prize to help his battle to become mayor. 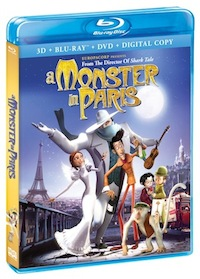 The unwitting scientists and the singer must team up to protect Franc, a monster with more than a musical career to protect! I am going to enjoy watching this one with the kids! We just watched this on the weekend with our family. We really enjoyed it.